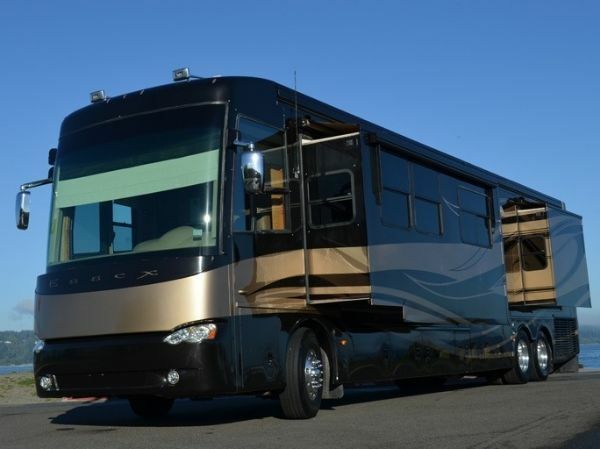 The Newmar Essex went under a complete transformation for the 2007 model year include all new front and rear caps, a one peice windshield, a roof mounted awning package and more. This is a stunning beautifully maintained coach that shows no trace of previous ownership and stored inside when not in use. No smoking no pets the interior is immaculate, the beautiful custom porcelain tile stretches from the front entry all the way through the galley and bathroom to the bedroom. The handsome solid cherry cabinets built by the Amish create a warm inviting interior space throughout the coach. The spectacular full body paint scheme perfectly compliments the sophisticated lines of this beautiful coach and will turn heads wherever your RV adventures take you. The optional equipment provided in this coach will make your life more comfortable on the road they include: a stacking washer dryer, Fisher & Paykel dish drawer, Frigidare residential refrigerator, additional passenger monitor to view all cameras and navigation, natural cherry cabinets, special custom sofa/dinette seating ensemble, power dining table adjusts up and down in and out to create a comfortable dining position, full polished porcelain tile floor, Corian shower walls with ceramic tile inserts, Girard awning package including power window awnings and roof mounted patio awnings that stretch the length of the coach.Spartan® K2 Chassis with IFS (Independent Front Suspension) Cummins® ISM 500-HP, Allison® 4000-MH Transmission Tag Axle, Automatic Traction Control, Power Comfort Drive® Steering, Accuride Accu-ShieldTM Aluminum Wheels, Four Point Hydraulic Jacks with Automatic Control & Chassis Air Leveling, Power Tilt-and-Telescope with Burl Wood VIP Smart Wheel, Memory Settings for Driver's Seat, Pedals, Steering Wheel & Exterior Mirrors, Cruise Control, Recessed Fuel Fills with Crossover to Fill from Either Side, Back-Up Alarm, Anti-Lock Braking System, Front Disc Brakes, Electronic Chassis Information Display in Dash, Chassis Service Center, Leece-Neville 200-Amp Alternator, 55-Degree Cramp Angle.Three 15M PenguinTM Heat Pump Central Air Conditioners with Remote Control Thermostat, Hydronic Zone Heating System, Dash Heater & High-Output Air Conditioner, Propane Leak Detector, 30" Convection Microwave Oven, Two-Burner Recessed Cooktop, Polished Corian® Range Cover, Residential Refrigerator, Stacking Washer/Dryer, Sony® 42" LCD Color TV in Living Area, 30" Phillips® LCD Mirror/Color TV/PC Monitor in Bedroom Pioneer® AM/FM Radio with CD Player & Combination, Rearview Color Monitor with Navigation System, Surround Sound System with CD & DVD Player, Bose® Wave Radio with CD Player & Alarm Clock in Bedroom, TV Antenna with Power Lift, Roof-Mounted Air Horns, 8.5" X 11" Safe, Universal Remote Control, VCR & Audio/Video Smart-Source Switch.